The Philadelphia Eagles raised a lot of eyebrows when they gave Fletcher Cox a 6-year, $103 million contract extension with $63 million guaranteed against injury, the most ever for a non-quarterback. But even though Cox is one of the best young defenders in the NFL, as we have seen with most of these large contracts, it is mostly smoke and mirrors. Because of the way the contract is structured, Cox will never see the final three or four years of the deal. 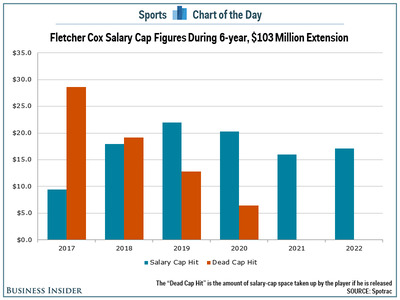 Cox’ new extension is really either a 2-year, $42.9 million deal or a 3-year, $59.7 million contract. That is still good. But it is not $103 million. The issue is simple salary-cap economics. The contract just won’t make financial sense for the Eagles by either the third or fourth season. In the third year of the extension (the extension begins in 2017), Cox is scheduled to take up $22 million against the salary cap. Even with the salary cap growing in the coming years, that is an enormous figure for a non-quarterback in the NFL. In year-4, his cap hit would be $20.3 million, but his “dead cap” figure (the amount charged to the team’s cap if a player is released) drops all the way down to $6.4 million. In other words, if Cox regresses as a player, he could be released prior to the 2019 season and would definitely be released prior to the 2020 season. If he is still a top player after the second or third years of the deal, the Eagles will want to negotiate a new extension to free up cap space. The one thing that could give the Eagles flexibility to wait until 2020 to re-do the contract is the rookie contract of quarterback Carson Wentz. His cap space will be a bargain through the 2019 season. If he pans out, it won’t be until 2020 when he starts to become an expensive quarterback. But Cox still has an ace up his sleeve. When it comes time to negotiate a contract to replace this one, Cox will have the power to extract more money from the Eagles in exchange for freeing up cap space. As long he remains a good player, he is going to get paid. It just won’t be from this contract.